The Eureka! Bowl. 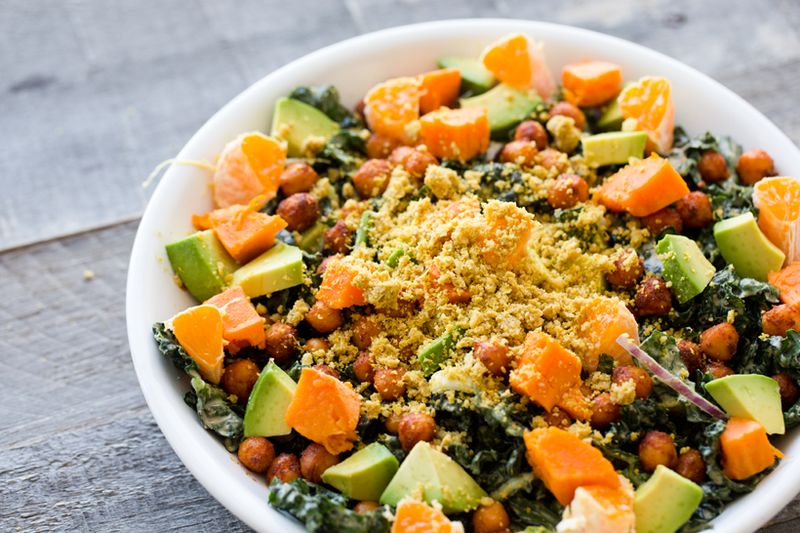 Peanutty Kale, Smoky-Maple Chickpeas, Sweet Potato, Avocado. Eureka! - a cry of joy or satisfaction when one finds or discovers something. 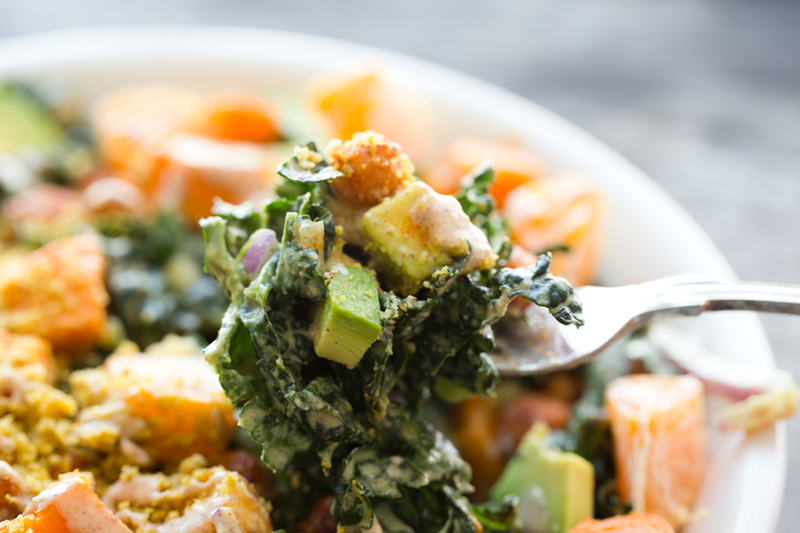 One bite from this fully loaded vegan bowl and you just might think you have struck gold. 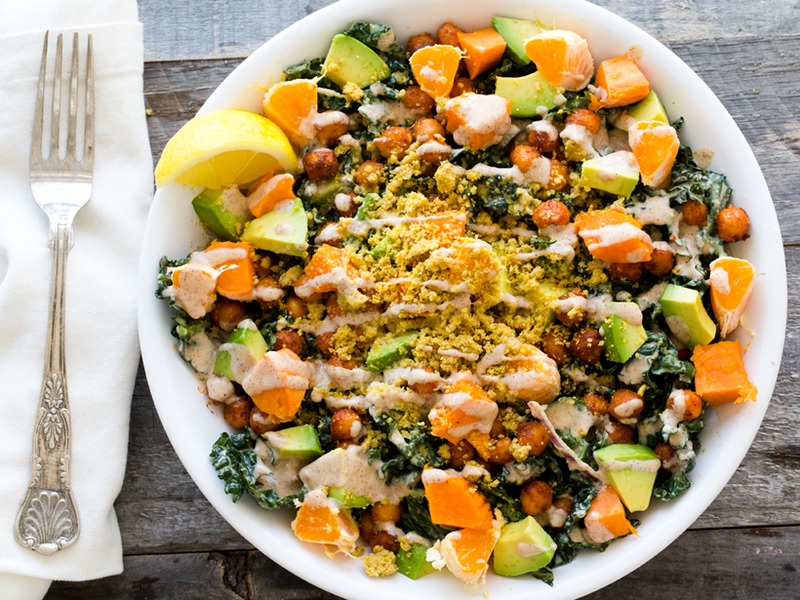 The golden sweet potato, cheezy vegan sprinkle and smoky-maple chickpea kind of gold! The Eureka! Bowl. These flavors are bold and alluring. 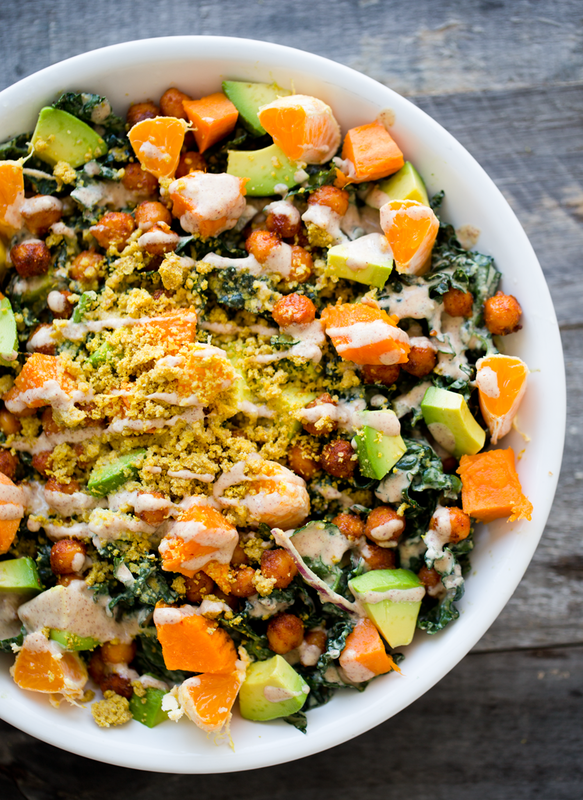 Creamy peanut-sauce smothered kale, skillet chickpeas with smoky maple flavors, buttery avocado and a nutritional yeast-walnut cheezy sprinkle on top. Grab your fork and dive into this glistening plant-based meal. There is a lot of edible GOLD to find in this bowl!.. 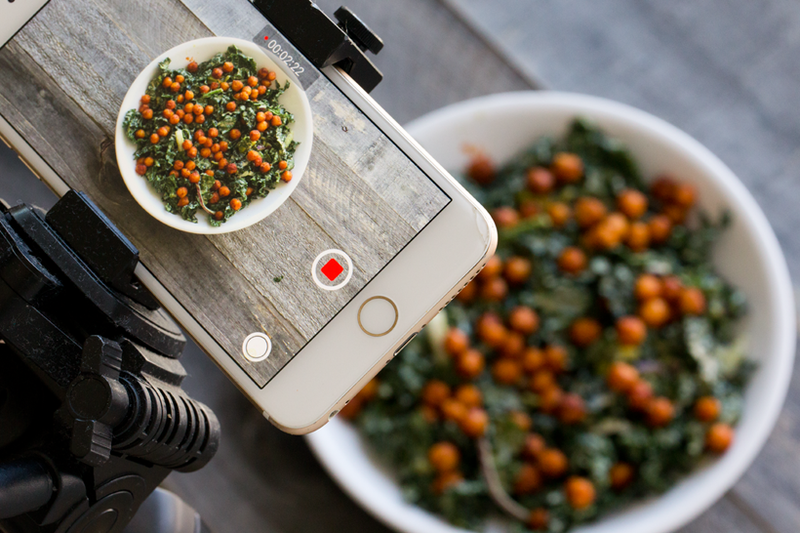 This awesome bowl starts with kale..
Add some skillet chickpeas, smothered in smoky-sweet flavors..
Add in a little YouTube video filming sesh..
Add in buttery avocado... always. Citrus, sweet potato, cheezy sprinkle.. GOLDmine foods.. 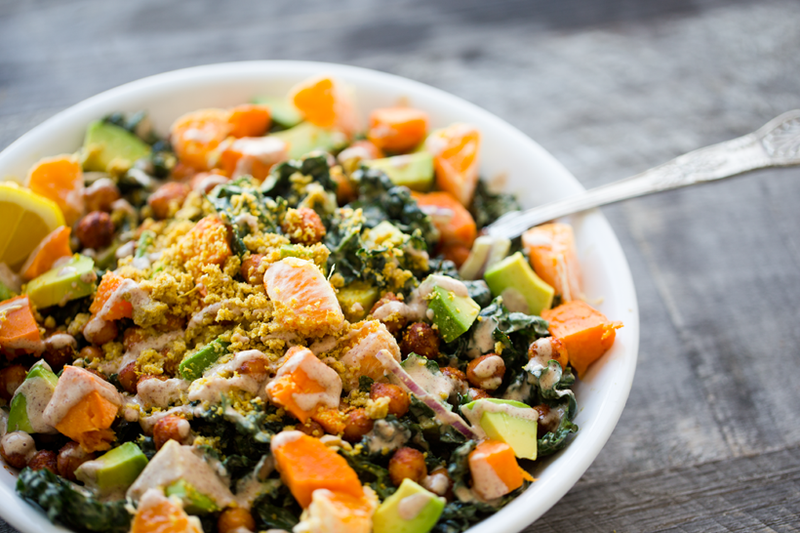 This dinner-approved bowl is gluten-free, soy-free and loaded with protein, healthy fats, fiber and nutrients. This is power food! 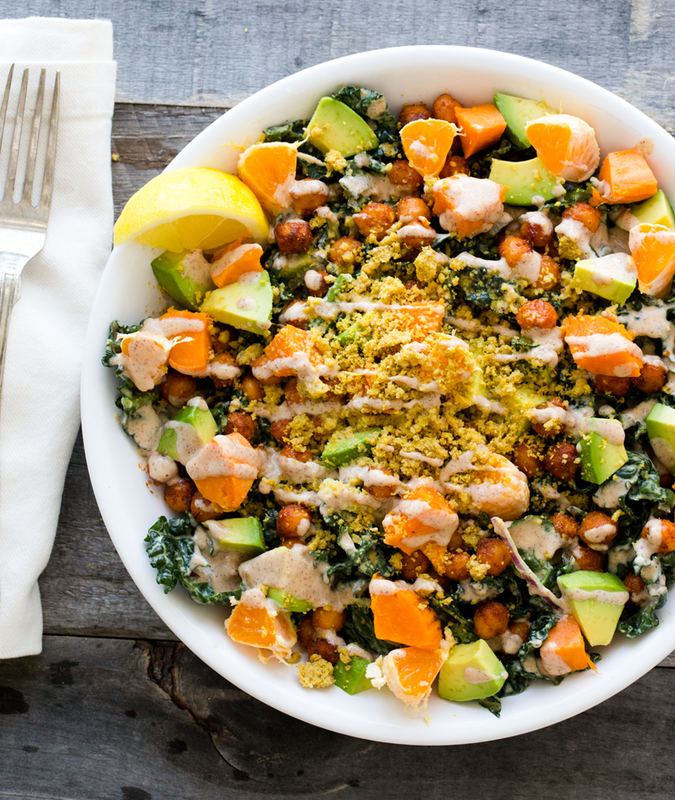 This dinner-sized bowl is loaded with kale, peanut sauce, chickpeas, cheezy sprinkle, citrus, sweet potatoes and more. Bake your sweet potato an hour ahead of time in a 400 degree oven for 30-50 minutes -- or until cooked through. Allow to cool a bit before peeling and cubing. You could also microwave your sweet potato -- or boil. Prepare your peanut sauce by blending the peanut butter, maple syrup and water in a blender until smooth. Kale: Remove the thick stalk of each kale leaf. Rinse leaves well in very hot water to help soften the kale a bit. 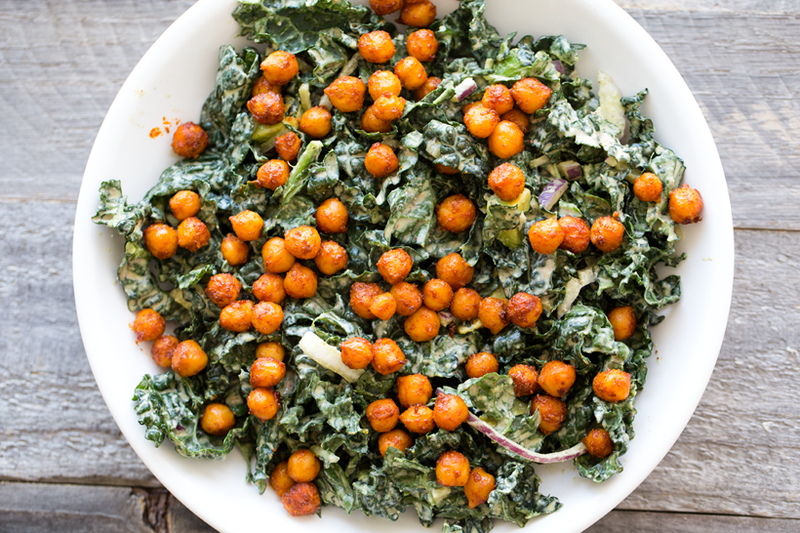 I use a fruit and veggie wash. Chop your kale into small bits and place kale in a large mixing bowl. Add the 1/2 cup red onion. 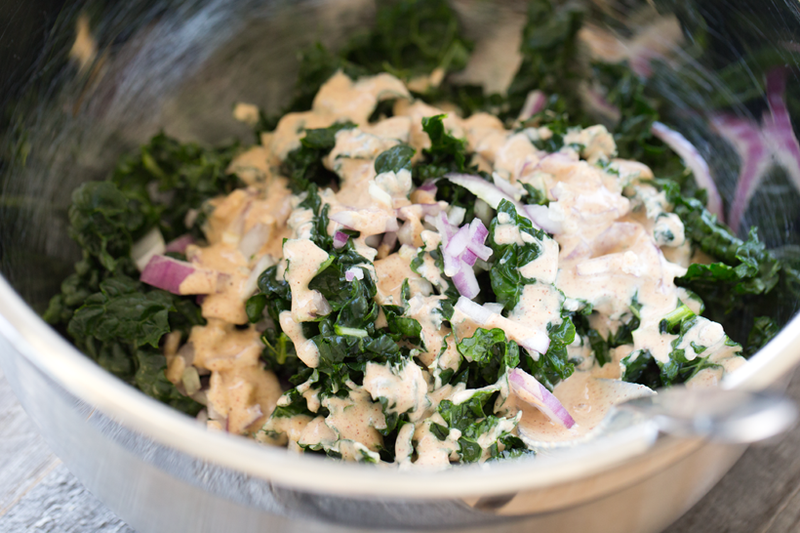 Pour about 1/4 cup of the peanut sauce over your washed and dried kale. Toss well. 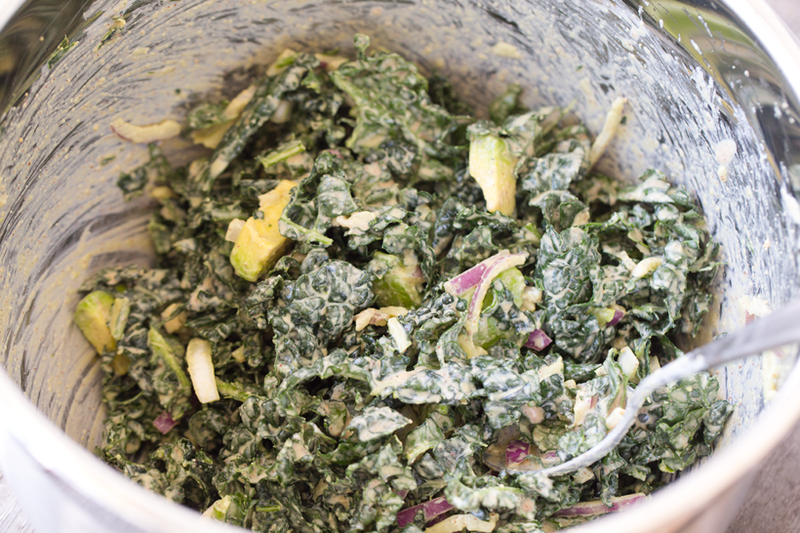 Place the kale in the fridge to marinate for at least 20 minutes before building bowls. 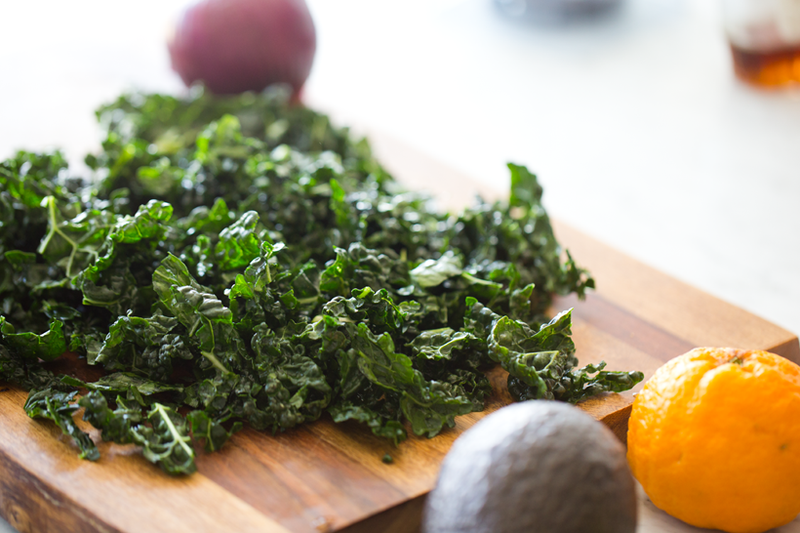 Note: If you want, you can add additional avocado and fold it into the kale salad now. 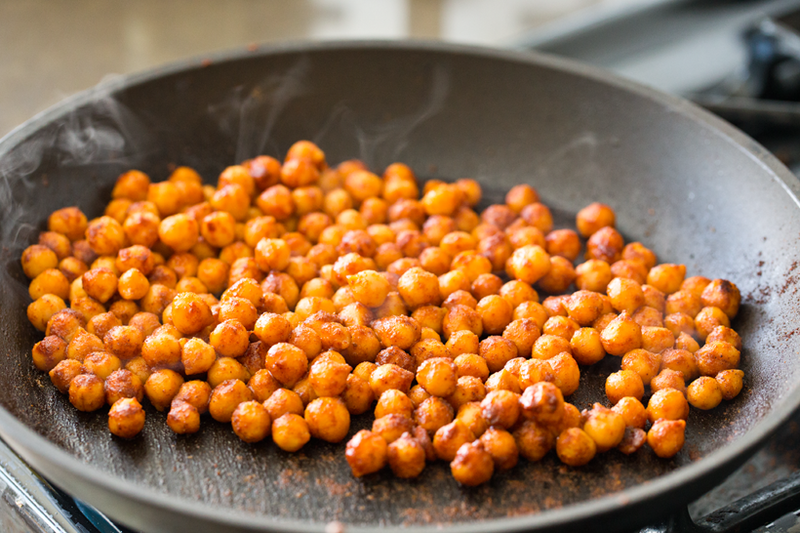 Chickpeas: Add the olive oil to your skillet, over high heat. Add the chickpeas and saute for 2-4 minutes until they start to brown a bit. Add the smoked paprika, nutritional yeast, tamari and maple syrup. Toss chickpeas a bit and cook for an additional 2 minutes or until the chickpeas are nicely caramel-brown in color and absorbed all the spices and flavors. 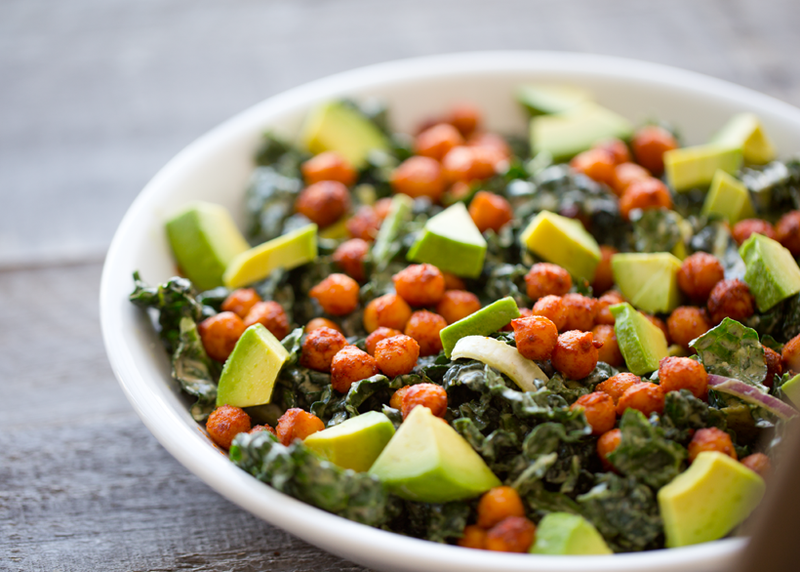 Turn off heat and set chickpeas aside. Cheezy Sprinkle: Blend the walnuts and nutritional yeast in a blender for about 30 seconds or pulse until it blends into a fine powder. Pour into a small bowl. Store the leftovers, covered, in the fridge. 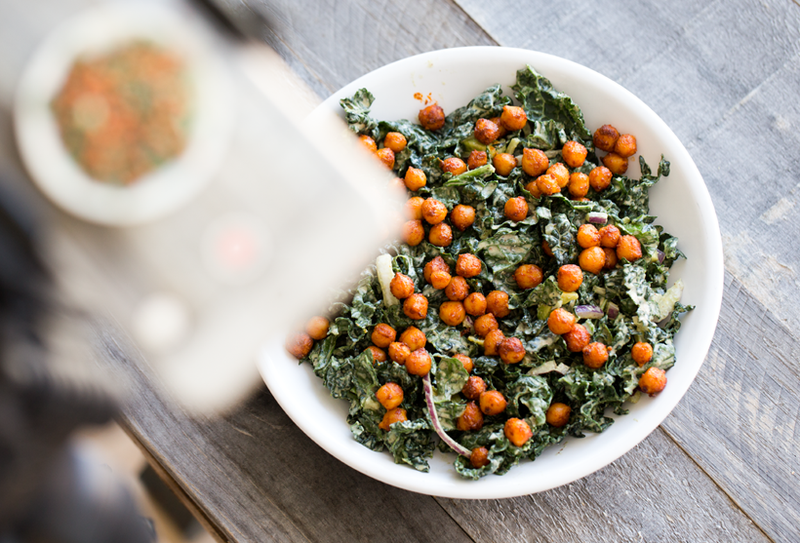 Start building your bowls: Add the peanut kale. Avocado. 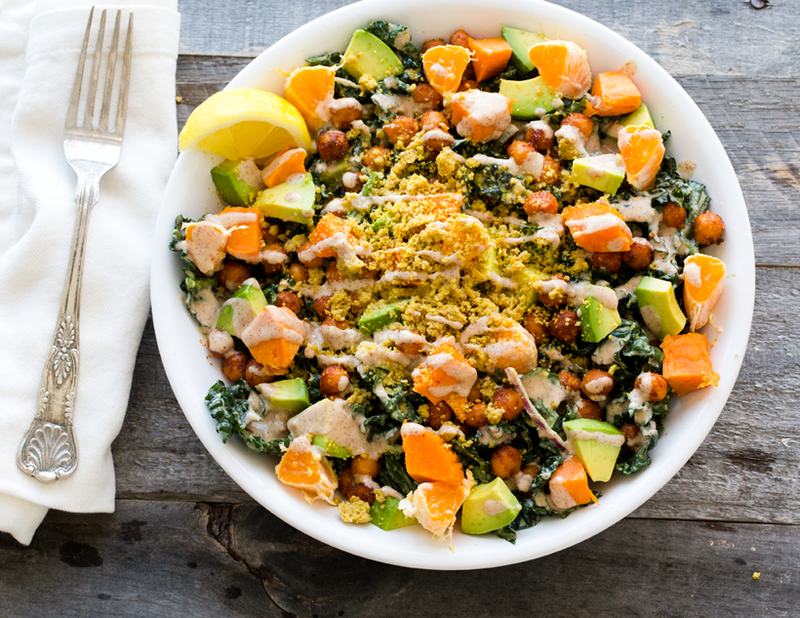 Sweet potato, citrus, chickpeas and as much cheezy sprinkle as you want. Then drizzle extra peanut sauce over top if desired. Serve with a squeeze of fresh lemon juice over top. Prep Time: 00 hrs. 59 mins.